This might not be a surprising move but it is a deceptive one. Note two important facts that didn’t make big news. 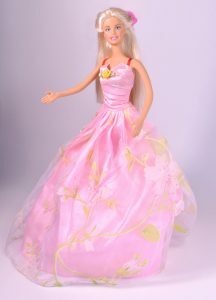 The first is that most of these new Barbies are one of a kind and won’t be available for sale. In other words, these weren’t really made to be sold, much less played with! They are just show-pieces for Mattel’s image. The second fact, rather astounding given Mattel’s touting of these new models, is the corporation’s decision to focus sales on a Barbie line that highlights baking and cooking. This strategy, buried in the pages of a February 16 Wall Street Journal article, explains that these are what Mattel has found to be “proven play patterns.” The previous things they tried did not create “a sustained experience over time.” That corporate cover talk means that what their marketing department has determined to be what little girls actually do with Barbies is use them to role-play in domestic settings. Cooking and baking will now be their main line of dolls, giving Barbie an ultimate kitchen where children can make pretend sandwiches, waffles and pies. This shift back of actual Barbie to domestic play, while Mathematician Barbie remains a showpiece, is especially funny to me, because I was a graduate student in computer science at NYU back when Talking Barbie first started saying, “Math is hard!” There was then an enormous uproar about how Mattel was discriminating against women by having Barbie say this when you pulled her string. I made the naïve mistake of posting on social media (back then we called it an email list) that this line was a good thing. Because math IS hard. And it showed that Barbie was actually doing some math instead of just combing her hair all the time. (And I was certainly having a hard time with the graduate math I was doing.) I was then excoriated by the community, including by my professors (! ), for not joining the cry of protest against Mattel. The backlash was so fierce that my wife worried that I would be thrown out of the program. Math continued to be hard but Barbie just stopped saying so. 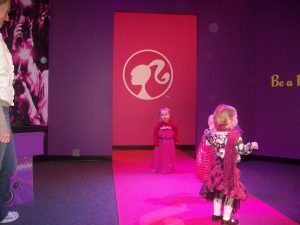 But what is particularly significant about this is how the essential economic motivation of Mattel is revealing what inspires little girls en mass. And it is not what the cultural gate-keepers want them to be their inspiration. Mattel is really in the business to make money, and has realized that they had better allow little girls to use Barbies to bake and cook if they are going to make money. Could it be because, before they are socially conditioned, these girls do want to find some way to provide rest to those in their lives, to make a home for those they love? Certainly cooking is not the only way to do that, but it is an easy to understand one. Poor Mattel. Even with such deft sleight of hand, I am not sure that they will be able to navigate this brave new genderless world. Fortunately, there are now Barbies without her previously exaggerated proportions, limiting the harm of creating unrealistic expectations in little girls for what they should look like (and in little boys too). But they just can’t win here because the reality doesn’t match the image. Which Barbie would you buy for your little girl?